A majority of Mexicans express confidence in Barack Obama to do the right thing regarding world affairs, and about as many credit Obama’s election with improving their opinion of the United States. 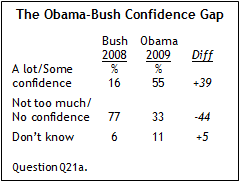 Mexicans have considerably more confidence in Obama than they did in his predecessor, George W. Bush. Mexicans generally approve of Obama’s international policies, and pluralities expect the American president to act multilaterally, taking the interests of countries like theirs into account and seeking international approval before using military force. Moreover, nearly half think Obama will take significant measures to control global climate change. Obama receives far more positive reviews from Mexicans than George W. Bush did as he neared the end of his presidency. 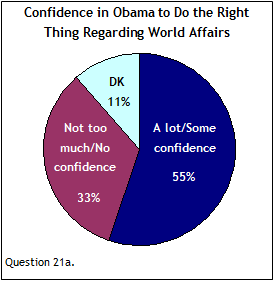 More than half (55%) say they have at least some confidence in Obama when it comes to international affairs, while one-third say they do not have much confidence in the American president. By contrast, in 2008, more than three-quarters of Mexicans (77%) said they did not have confidence in Bush and just 16% expressed confidence in the then-president when it came to international affairs. Mexicans are largely unfamiliar with the other Western leaders included in the survey; majorities express no opinion about French President Nicolas Sarkozy (52%) and German Chancellor Angela Merkel (54%). Venezuelan President Hugo Chavez is broadly unpopular among Mexicans – more than six-in-ten (63%) say they do not have confidence in the Venezuelan leader to do the right thing regarding world affairs. Election Improved Opinion of U.S.
About half of Mexicans (51%) say the election of Barack Obama led them to have a more favorable view of the United States; 15% say they have a less favorable opinion of the U.S. as a result of his election and 25% say their opinion of the U.S. has not changed. Compared with publics in the other two Latin American countries included in the survey – Brazil and Argentina – Mexicans are much less likely to say that Obama’s election improved their opinion of the U.S. More than three-quarters in Brazil (77%) and 61% in Argentina say that is the case. Publics in all of the Western European and African countries surveyed, as well as in most Asian countries, are also more likely than Mexicans to say the election changed their opinion of the U.S. for the better. 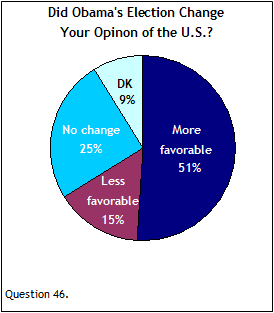 Pluralities of Mexicans expect Obama to approach international policymaking in a multilateral fashion. Just under half say Obama will take the interests of countries like Mexico into account when making foreign policy decisions (47%), and about the same number (45%) say the U.S. president will seek international approval before using military force. 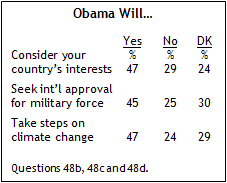 Similarly, about half (47%) expect Obama to take significant measures to control global climate change. Close to six-in-ten (56%) Mexicans say they approve of Obama’s international policies overall, while 17% disapprove.